This MI driving test, with multiple choice questions, is intended to help you prepare for the Michigan permit test that is required before you can get your driver’s license. If you have completed a defensive driving course, you may be able to save on your auto insurance premiums when buying a new or used car either by financing, leasing or through a bank car loan. Before you take the Michigan permit test, you can take our practice tests. These tests include everything you will need to know for the real test. Before you take the MI driving test, you can take our practice tests. These tests include everything you will need to know for the real test. Gain access to hundreds of free realistic practice questions and pass your driving test first time with our free test practice! This online practice written test is intended to help you prepare for the permit test that is required before you can get your driver’s license. We love to help out new drivers and we have even put together eight different tests to help you study for the big day. Try your sample test today. We have eight different tests, all of which will help you learn everything that could be on the real test. Passing the written test is mandatory in order to receive your license from the state of Michigan. It is the final step in becoming an official, licensed driver. Taking our FREE practice questions and answers can get you behind the wheel in no-time. Over 200 Q&A updated in 2019. Michigan Permit Test: Want Help Studying? How to use seat belts, and how to safely use car seats. What the signs are based on shape, size, and symbols. For example, a circle with a line through it means “no,” and a yellow pennant sign indicates no passing zone. The difference between solid white lines, broken white lines, solid yellow lines, and broken yellow lines. We will also help you learn how to recognize bicycle lanes and what the stop lines and directional arrows painted on roads mean. Most people know what a red, yellow, or green light means. But, we will help you learn what it means when those colors are flashing and what it means when there is an arrow within the color. Michigan uses HAWK signals, and we will help you learn what the different colors mean and what it means when those colors are flashing or are steady. The parts of your car that you need to check such as turn signals, brake lights, and windshield wipers. We’ll also help you learn about blind spots and how to check your blind spots. Michigan has a Basic Speed Law, and we will help you understand what that law means for you as a driver. As you can see, Michigan has several laws and regulations you must know to pass the driving test. Take some time, learn the material, study, and contact us for some practice tests. As a new driver, you must pass the driving skills test before you are eligible to receive a Michigan driver’s license from the Secretary of State office. This website will prepare you for the driving skills test you are required to take. 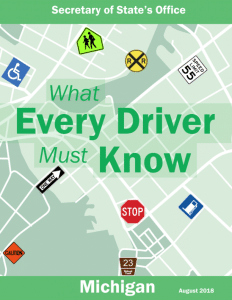 Teens in the Graduated Driver Licensing program must pass a knowledge test as a part of the Segment 1 driver education class. A Temporary Instruction Permit (TIP) allows you to practice driving with a licensed adult for up to 180 days. A TIP is issued if you are age 18 or older.